The Seminole Cup, the main event within the Sea Island Sporting Classic, takes place on Broadfield’s grounds. The Seminole Cup, one of the premier shooting tournaments in the South, celebrates its 25th anniversary. 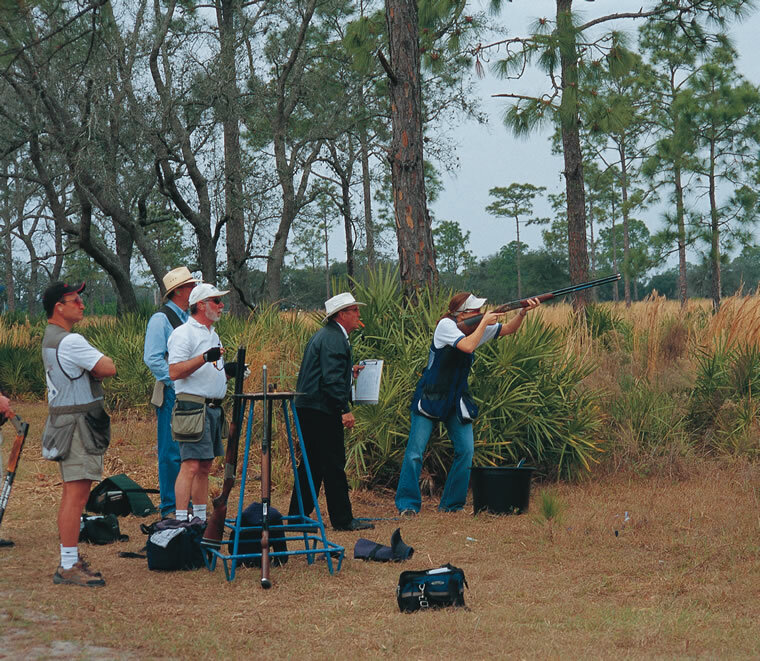 When Randy Mitchell first started the Seminole Cup nearly 25 years ago, it was a small shooting event held at Southmere Sporting Clays in Titusville, Florida. Around 70 shooters gathered during a balmy Florida spring to participate in the inaugural tournament. Fast-forward to the present, and the Seminole Cup is now the main event within the Sea Island Sporting Classic, spanning five days with over 500 participants congregating on the sprawling, 5,800-acre hunting preserve of Broadfield, A Sea Island Sporting Club and Lodge. Now more than ever it has hit its stride as one of the major shooting tournaments of the year, more akin to a festival than your average competition. Since it began, the Seminole Cup had several homes throughout Florida before eventually settling at Broadfield. It was at one of the early Seminole Cups that Mitchell’s daughter, Jessica Mitchell Kent, met her future husband, a participant in the shoot at the time, Jon Kent. It was Kent who eventually took over the handling of the Seminole Cup in 2015 when his father-in-law retired and the tournament moved to Broadfield. Covered in oak trees and towering pines, the hunting preserve is used primarily by Broadfield’s club members as well as guests and members of Sea Island. It is only open to the public for this event. Jessica Mitchell Kent (far right) is the daughter of Seminole Cup founder Randy Mitchell. The pristine condition of the playing fields is one of the tournament’s most unique aspects. “We consistently receive comments from the participants on how nice it is to shoot on such beautiful, untouched grounds,” Kent says. Wendell Cherry, one of the best shooting instructors in the country, was at the very first Seminole Cup shoot and has participated in every one since, winning it five times. The central location of the shoot has also helped to draw even more participants each year, as has the impressive purse, which is one of the largest of any shooting tournament. On top of the $50,000 cash purse, there is around $20,000 worth of other prizes given out each year. 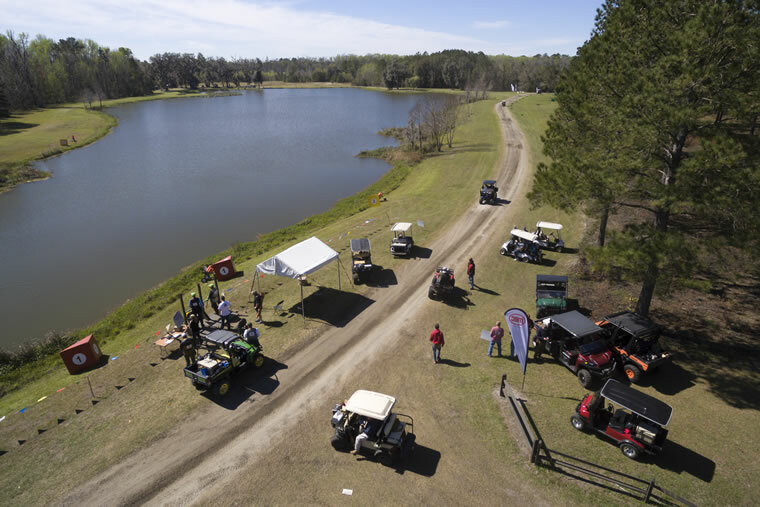 One special prize that will be offered in 2018 is a golf cart customized for sporting clays that will go to the top shooter during the EZ-GO Challenge, valued around $10,000. While participants can expect impressive incentives, attendees can expect fun events that the whole family can enjoy—another unique quality the tournament has taken on since moving to Broadfield. A bounce house and falconer are sure to delight younger guests. The prime rib dinner prepared by the Sea Island culinary team on Saturday night will also delight all ages, as will the breakfast and lunch dishes provided by Southern Soul Barbeque. “I can’t say enough good things about the food,” Kent adds. In 2018, mainstays at the event like Cherry will once again be joining hundreds of other shooters to participate in the tradition that has become the Seminole Cup. The 25th Seminole Cup will be held from Feb. 28 through March 4. It starts off on Wednesday with one competitive event and fewer than 100 shooters on the property. On Thursday, the tournament will gather more steam with preliminary events and around 250 shooters present, and by Friday afternoon the event will be in full swing; Broadfield is looking to increase the total number of shooters to over 600. “The 2018 shoot is going to be our 25th anniversary, so we’ve got some things in store to make it special,” Kent says. “We’re working with sponsors to have some special giveaways.” Along with those giveaways, this year’s main event will be a Scholastic Clay Target Program (SCTP) tour stop, which should draw a large number of Junior and Sub-Juniors shooters. After a variety of former hosts throughout the South, it’s clear that the Seminole Cup has found a home at Broadfield, where the tradition is sure to continue to grow and thrive as the years go on.